Traffic cameras aren’t really known for taking particularly interesting images of the local wildlife (or anything interesting for that matter), but as this jaw-dropping photo attests, sometimes the nature comes to you. The image, one of three jaw-dropping frames captured on January 3, 2016, shows the owl in flight, spreading its white and black-spotted wings against a snowy backdrop. The photo was captured along highway 40 in western Montreal. Frei says snowy owls breed north of the Arctic Circle, where they hunt in the summer. Quebec transport minister Robert Poëti posted this tweet earlier today. 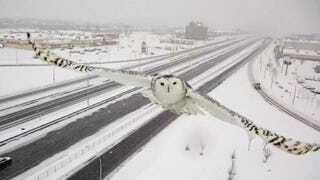 Translated, the text reads: “Beautiful snowy owl taken by the road network surveillance cameras on the A-40 in western MTL.” Beautiful, indeed.